Many skeptics often question the relevance of the various incomprehensible divine pastimes of Shri Krishna. Cheer Haran Leela or the pastime of Shri Krishna where He stole the clothes of the Gopis while they were taking a bath is one of those pastimes. Shri Krishna’s leelas or pastimes are incomprehensible even by some God realized souls. The divine nectar of these pastimes is experienced only by those most intimate maidens of Braj, who are constantly engaged in selfless service towards Shri Radha Krishna, being completely oblivious to their own needs, desires or pleasure. Hence, it is very important to reflect on this point. The 21st chapter of the 10th canto of Srimad Bhagwatam states that some of the unmarried milk maidens of Vrindaban were attracted towards the irresistible beauty of Shri Krishna and the beautiful melodies of his flute. They secretly desired to attain Shri Krishna as their beloved. The 22nd chapter of 10th canto further states that these highly fortunate milk maidens of Braj diligently engaged themselves in the pursuit of their secret heart felt desire. They used to wake up early in the morning to take a bath in the river Yamuna, lovingly singing the names of Shri Krishna. They did not care about what others thought of them. They made a sand-idol of Goddess Katyayani Devi and started worshiping Her with an earnest desire to obtain Lord Shri Krishna as their eternal beloved. Nandagōpasutaṁ dēvi! Patiṁ mēṁ kurū tē namaḥ. Iti mantraṁ japantyastāḥ pūjāṁ cakruḥ kumārikāḥ. O Mahamaya, Mahayogini ! O Goddess Katyayini ! We beseech for your mercy to bless us that we may attain Shyam Sundar as our eternal beloved. Upon completion of their prayers, the Omniscient Lord Krishna appeared in front of them to grant them a boon to fulfill their desire, for He knew that it was He, who they worshiped under the pretext of worshiping Katyayani Devi. A devotee, on his own, cannot complete the process of self-surrender. Just like preparatory devotion (sadhana) is an action, surrender too is an action. An aspirant can surrender everything except their own self. Finally, God has to come Himself to accept one’s determination of self-surrender. In this way, He takes away, both the feeling of surrender and the very existence of the surrendered soul. At this point, the lover and beloved become one. A devotee has to prepare oneself and make a firm resolve to surrender completely unto His lotus feet. But the perfection of surrender is performed by God Himself. The exclusive purpose behind all the leelas of God is to put forth an ideal and to teach a lesson to mankind. In this leela as well, He did not transgress any modesty rather he put forth the highest ideal of modesty. 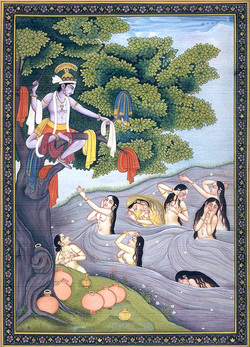 The gopis were taking a bath in the river without any clothes covering their bodies. This act of bathing in the open without covering oneself is a sin as per our scriptures. Lord Krishna made them realize their transgression and chastised them for the same. Eventually the gopis came in front of Shri Krishna, trying to cover themselves with their hands and their eyes lowered in shame and embarrassment. Just think, the gopis, who firmly know and believe that Shri Krishna is the Supreme God and who have accepted Lord Krishna as their soul and constantly desire for His eternal association, are hesitant to come out uncovered in front of Shri Krishna! Was this not a sign of lacking complete surrender? Despite having pure sentiments, they were unable to achieve the rewards of self-surrender. Lord Krishna reminded them of the ultimate objective of their steadfast devotion to Him and asked them the reason behind trying to maintain their privacy. 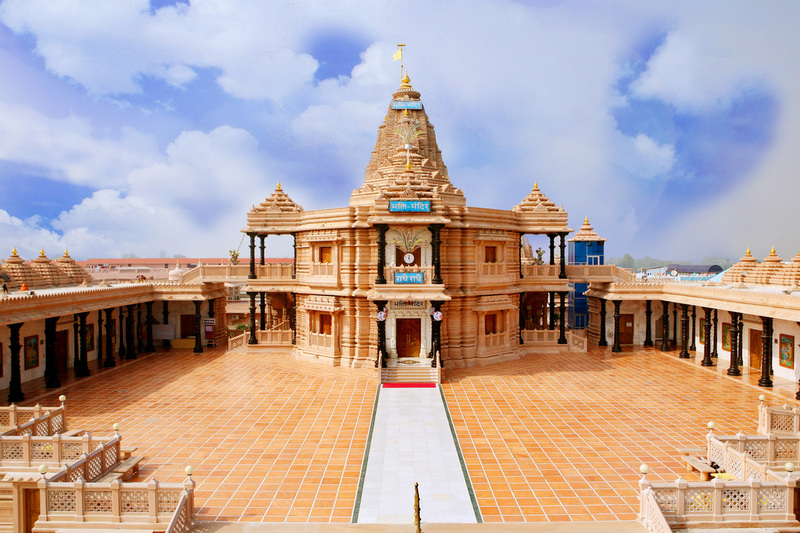 The gopis said, “O Pran Vallabh (beloved)!, we want to leave the decorum of society for You, yet our bad impressions (sanskars) of many previous lives are preventing us from doing so. We are helpless”. Lord Krishna said, “look up at Me just once”. Shri Krishna said "Look at Me just once"
They looked up at Lord Krishna and their hands naturally came together to pay their respects and seek His blessings. They forgot all about covering and also who should be covered. Thus, they simultaneously forgot about their surrender and the surrendering entity as well. Their devotion reached the pinnacle of perfection and all barriers between them and Shri Krishna were broken. Lord Krishna brought them back to their physical consciousness and returned their clothes. He also gave them an assurance that He will fulfill their desire exactly one year from this day. Thus, He made them deserving-souls for attaining the unparalleled supreme bliss of Maharas. Reflect on this point now: Shri Krishna was only 9 years old at this time, He brought their pursuit to completion and returned their clothes without touching them. An year later, on the night of Sharad Poornima He showered the nectar of Maharas on these Gopis along with other deserving souls. To establish an ideal in front of the society. Teach us the true meaning of self-surrender (Atma-nivedan आत्म-निवेदन).